For the community it could be the answer to its prayers. When the small village of Whitwell on the Isle of Wight lost its post office two years ago - parishioners were determined not to let their community disappear with it. 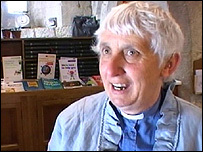 The Reverend Sandra Lloyd struck on the idea of offering the church space for a "visiting post office". After months of planning, the medieval parish church of St Mary and St Rhadegund opened its own post office last week. People can now buy stamps, post their parcels and pay their bills all from among the ropes of the looming bell tower. It's a mutually beneficial arrangement for the village - retaining a post office and the church at the heart of the community. And its a mutually beneficial arrangement that both the Church of England and the Post Office seem keen to develop. Hundreds of post offices have closed nationally with another 2,500 set to go by 2009 to save costs. Last week Post Office staff threatened to strike after the company announced that 70 crown post offices nationally will be moved to branches of WH Smiths. "When the former (Whitwell) sub postmaster resigned we could not find suitable premises for a Post Office locally," said a Post Office spokesman. "The answer to our prayers was the offer from St Rhadegund's Church. "Our partnership is just another active example of how we have been working with communities on innovative ways of retaining Post Office services in rural areas." And the Church of England is keen to explore the relationship further encouraging its churches to consider offering postal facilities. "Whether to go ahead or not is decided at local level after discussion in the community," said a spokesman. 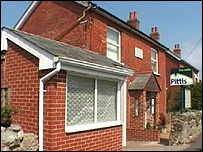 In Whitwell, Mrs Lloyd sees the move as a natural progression. "This became a village devoid of facilities," she said. "I think God has always been in the communication business so this is probably a good place to be both communicating with people and allowing people to communicate further afield. "It seemed obvious to offer the space that's the church in order to provide something that the people need. Postmistress Mavis Barclay said the response has been "terrific"
"There's been a terrific response." 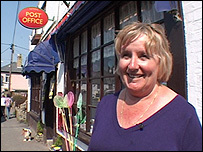 Postmistress Mavis Barclay, who runs the post office in the neighbouring village of Niton, agreed to offer the new service on a Monday and a Friday. "It's extra work," she said. "But the feedback we are getting from the people of Whitwell is so good - the atmosphere in the church is brilliant, so it's worth it." Local traders are able to sell their wares alongside the new post office - and with a laundry service in the pipeline, going to church may never again have quite the same connotation. 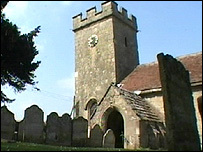 Whitwell residents can now pay their bills at their local church. What price a post office?